Who is involved: EWGPWD was established in 2012 following a meeting in Glasgow jointly organised by Alzheimer Europe, Alzheimer Scotland and the Scottish Dementia Working Group that was attended by nine people with dementia, their carers and 20 delegates from the national Alzheimer associations of Austria, Bulgaria, Norway, Slovenia and Spain. Nature of activity: The EWGPWD is composed of people with dementia. 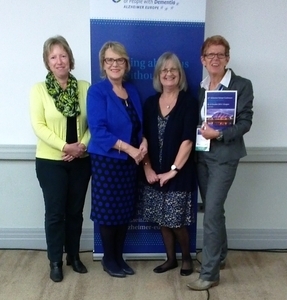 They work to ensure that the activities, projects and meetings of Alzheimer Europe duly reflect the priorities and views of people with dementia. The group operates independently, with its own Board and agenda of activities. The Chairperson of the EWGPWD also sits on the Board of Alzheimer Europe.